Rudyard Kipling was so impressed with the landscape and wildlife of Kanha National Park that he wrote “The Jungle Book”. No sooner you enter Kanha’s 940 sq.km area than you get the feeling of having been embraced warmly by nature in this one of the largest national parks in Madhya Pradesh. Kanha National Park has several achievements to its credit. Not only did it play a crucial role in saving the Barasingha from extinction, it is also one of the best administered parks in India. Kanha National Park is where the roar of a tiger nearby, an elephant rolling around in the mud or an impatient call by an Indian Roller, leave you exhilarated and remind you gently of nature’s infinite beauty! The park is home to more than 350 species of birds, 70 species of trees, 200 species of flowering plants along with more than 50 species of animals. It is here that the documentary by National Geographic, “Land of the Tigers”, was shot. As a tourist though, it’s not just the magnificent Royal Bengal Tiger which captivates you, there is the dainty Barasingha and ferocious wild dogs. Then, you also come across places like Shravan Tal, associated with a major episode in the Hindu mythological epic, Ramayana. Indeed, nature and mythology come together to make it a fascinating place, hiding many wonders which are only discovered with one, or many visits! Total Coverage Area: 940 sq. kms Surrounded Area: Surrounded by 100, 500 hectares of additional buffer area. Extended In: 1933 as a sanctuary Declared as a National Park: In 1955 Became a Tiger Reserve: In 1975 Distance from Panna National Park: 350 Km Approx. Kanha National Park is home to an incredible variety of flora and fauna. Besides the Royal Bengal Tiger which is found in significant numbers, the park is also home to other animals like barasingha, wild dogs and leopards. Around 350 species of birds and flora can be found inside the park. Its flora is as impressive as its fauna, with the park boasting more than 70 species of trees and 200 species of flowering plants. The vegetation of the park is mostly of dry deciduous type, with trees like mahua, sal, lendia, saja, dhawa and bija found in large numbers. It is this incredible variety of wildlife which makes Kanha National Park one of the most visited wildlife sanctuaries in India. Safaris in Kanha National Park vary according to the seasons. During the winters as well as the summers, there are separate timings for enjoying a safari. In winter, from the months of October to January, the safari is conducted in the morning from 06: 15 to 12:15 AM, and in the evening from 3:30 to 6:30 PM. During summer, from the months of February to June, the safari is conducted in the morning from 6:00 to 12:00 AM, and in the evening from 3:30 to 6:30 PM. It should also be noted that evening shift of the safari is closed on all Wednesdays. We provide you incredible wildlife safari tour packages to let you experience the best of sightseeing and exploration. Our wildlife tour packages are the best way of enjoying the beauty of Kanha National Park. Book a trip and choose from our wildlife safari tour packages to get the best in terms of accommodation, transport, and wildlife safari. So why wait? 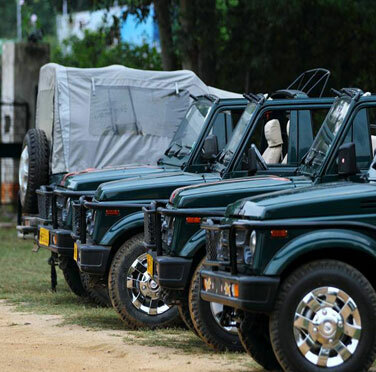 Plan a visit to Kanha National Park with our wildlife safari holiday packages and have an experience of a lifetime! Kanha National Park is divided into four zones – Kanha, Kisli, Mukki and Sarhi. Of these, Kanha is the oldest zone. Tiger sightings were initially exclusive to the Kanha zone. Nowadays however, they can be sighted in any of the four zones. The park also has six buffer zones – Khatia, Motinala, Khapa, Sijhora, Samnapur and Garhi. 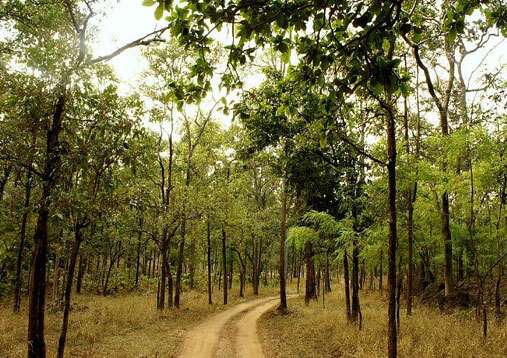 Kanha National Park remains open for visitors from October to June. You can visit it anytime during these months. The summer season in Madhya Pradesh starts from March and lasts till June. You should plan a visit to Kanha National Park during this time because tigers and other animals frequently visit waterholes, and the chances of sighting them are very high. Winters are the best time to visit Kanha National Park, as the temperature is cool and pleasant, and perfect for enjoying a safari. Winters are also when a lot of migratory birds visit the park. Kanha National Park remains closed for visitors during the monsoon season, from the months of July to September. The nearest airport to Kanha National Park is Jabalpur airport (170 km) which is well connected to all the major cities of India. From there, you can hire taxis and private vehicles to reach the park. The nearest railway station to Kanha National Park is Gondia Junction Railway Station (123 km). From there, you can hire taxis and private vehicles to reach the park.